Turning the world green. The architecture of the great outdoors. 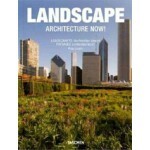 One of the hottest areas of contemporary design is clearly landscape architecture. No matter what the architectural style of the moment, the green areas around houses, stadiums or corporate headquarters have taken on a considerable importance, all the more so with the emphasis on ecology and green design. This book calls on the work of the top designers of the moment, from Ken Smith, author of the "Museum of Modern Art's" rooftop garden to West8 from Rotterdam, but also on architects ranging from Foreign Office to Tadao Ando who have long been fascinated by the environments of their buildings. There are new names like the Lebanese landscape architect Vladimir Djurovic and well-known ones like Martha Schwartz. There are established firms like the Wirtz family from Belgium or Gustafson Porter from the United States and young creators like Sophie Agata Ambroise from Lugano. 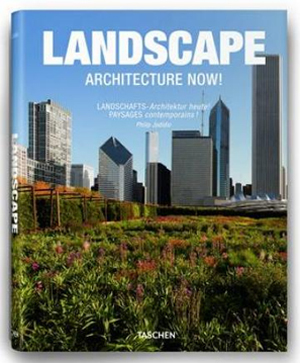 The limit between architecture and landscape architecture is not always easy to define, but this new book opens the doors and windows of today's architecture into the gardens of tomorrow. Featured architects and practices include: AECOM, Tadao Ando, Balmori Associates, Patrick Blanc, Caffarena, Cobos et al, Cervino Lopez, Vladimir Djurovic, DSR, Peter Eisenman, EMBT, James Corner Field, Glavovic Studio, Carrilho da Graca, Gustaffson Guthrie, Gustaffson Porter, Zaha Hadid, Herzog & de Meuron, Steven Holl, Martin Hurtado, Raymond Jungles, Maya Lin, LRO, Giovanni Maciocco, Michael Maltzan, Mecanoo, Fernando Menis, Eduardo de Miguel, Catherine Mosbach, Sotoji Nakamura, Victor Neves, NGBM, Nieto Sobejano, Officina del Paesaggio, Okra, John Pawson, Renzo Piano, Palerm Tabares, Masuno Shunmyo, Ken Smith, Taylor Cullity Lethlean, Michael van Valkenburgh, Weiss Manfredi, West8, and Wirtz International, Work AC.